The Pentagon, meanwhile, is moving ahead with designing a new ground-based missile to counter Russia's illegal cruise missiles built in violation of the 1987 Intermediate-range Nuclear Force (INF) Treaty. Andrea Thompson, undersecretary of state for arms control and international security, told a Senate hearing Tuesday that Russia's new strategic weapons announced in February, are a factor in whether the United States will seek to extend New START. "No decision's been made at this time," she told the Senate Foreign Relations Committee. "All options are on the table." Among the options being considered are withdrawing from New START; re-negotiating inspection and verification provisions as part of treaty extension; or adopting a more limited and simple agreement similar to the 2002 Moscow Treaty that called for significant reductions in strategic offensive arms. "Among issues to consider will be Russia's decision to manufacture compliance issues regarding U.S. weapons, and the uncertainty of whether or not Russia's recently announced strategic nuclear weapons will be held accountable under the treaty," Thompson explained in her prepared testimony. In response to U.S. questioning of Russian treaty violations, Moscow has responded with disinformation and false counter charges of U.S. noncompliance. "Russia's response to each of these situations is to employ its standard playbook of distraction, misinformation, and counter-accusations," Thompson said. David Trachtenberg, deputy undersecretary of defense for policy, also said extension of New START is uncertain. "Any decision on extending the treaty will, and should be, based on a realistic assessment of whether the New START treaty remains in our national security interests in light of overall Russian arms control behavior," Trachtenberg testified. Trachtenberg said the arms treaty provides for on-site inspections and monitoring that are useful and beneficial. 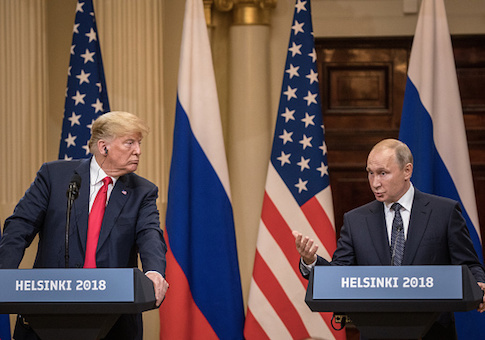 However, he added: "That said, what I find particularly troubling is the overall nature of Russian arms control behavior and what the Russians seem to be doing in terms of selectively complying with various provisions of treaties and selectively non-complying with others when they feel it's not in their interest." Moscow and Washington reached the reduced arms levels of 1,550 deployed nuclear warheads in February and the treaty expires in 2021. Russia has launched a large-scale nuclear modernization that includes new missiles and submarines in addition to new revolutionary arms. The United States is investing more than $1.2 trillion over the next 30 years to modernize its aging nuclear forces, including new ground-based missiles, new missile submarines, and a new bomber. Russian President Vladimir Putin in February disclosed several new strategic weapons systems violate new START. The new arms include nuclear-armed hypersonic cruise missiles, a long-range nuclear-powered missile, and an underwater drone submarine capable of delivering a massive, multi-megaton nuclear warhead. Under New START, Russia is obligated to notify the United States that the new weapons are under development and will be counted under the treaty. Sen. Marco Rubio (R., Fla.) asked Thompson whether the announced new Russian weapons are covered under New START. "They would count as strategic weapons," she said, noting that the Russians have not made any notification of the new weapons. Thompson also said the new strategic weapons under development by Russia have not been discussed in U.S.-Russian arms talks and she could not say if the U.S. side had asked the Russians about the New START-accountable weapons. Rubio said that Putin's speech describing new strategic weapons should have triggered someone in charge of arms control to question the Russians about them and "if that's true, you need to notify that [because] that violates START." "Senator we're taking action on it. We haven't done it through the formal New START process with our counterparts," Thompson said. Rubio later commended Thompson for recognizing the need to determine whether Russia’s new arms are covered under New START before any decision is made on extending the treaty. "These new kinds of strategic arms could be destabilizing, so the United States must directly raise its concerns about these emerging systems with the Russian Federation at every opportunity, if it truly hasn’t done so already," Rubio told the Washington Free Beacon. Republicans and Democrats on the committee appeared divided over whether to extend New START. Sen. Bob Menendez (D., N.J.) suggested that abandoning New START in 2021 could prompt the Pentagon to seek a "larger and more expensive nuclear force." Sen. James Risch, (R., Idaho), said he opposed the New START treaty when it was ratified by the Senate in 2010 and noted the difficulty of dealing with the Russians on any arms accords. "Trying to negotiate with people who are not negotiating in good faith is a problem," Risch said. Risch opposed New START because "I don't have any confidence that [the Russians] are negotiating in good faith," he said. "They're serial cheaters. They're serial liars and you have to look at the other things they are doing in the world to judge what kind of a mind these people have as far as whether they're acting in good faith," Risch said. Thompson said in addition to the INF violations and potential New START violations, Moscow violated a ban on the use of chemical weapons in conducting the assassination attempt against a Russian defector and his daughter in England. Moscow also is tacitly supporting Syrian President Bashar al-Assad's use of chemical weapons attacks in Syria, she noted. Trachtenberg said New START was concluded with the idea of building better relations with Russia. Since then, ties have deteriorated and "we must be clear eyed about the threats we face," he said. In addition to INF and New START issues, Russia also is not adhering to the Conventional Armed Forces in Europe Treaty, the Budapest Memorandum on security assurances, the Helsinki Accords, and the Presidential Nuclear Initiatives on tactical nuclear arms, he said. Moscow also is violating the Open Skies Treaty while selectively implementing the Vienna Document on exchanges of military information, Trachtenberg said. Committee Chairman Sen. Bob Corker (R., Tenn.)said: "Out of four agreements—New START, the INF Treaty, the Open Skies Treaty, and the Chemical Weapons Convention—we have significant problems with Russian compliance of three of them." On the INF violation, Moscow is in material breach of the accord for deploying significant numbers of a new, intermediate-range, ground-launched cruise missiles called the SSC-8. Thompson said the Trump administration has used diplomatic, military, and economic steps to pressure Russia to return to INF compliance. Under recent legislation, the Pentagon is conducting INF treaty-compliant research into a new ground based missile that "if completed, would be noncompliant with INF," she said. "This system is designed to be a direct counter to Russia, and the United States has made it clear that we will cease pursuing its development if Russia returns to compliance with the treaty," Thompson said. Two Russian defense contractors involved in the SSC-8 missile, Novator Design Bureau and Titan Central Design Bureau, were sanctioned in September. "The lack of any meaningful steps by Russia to return to compliance diminishes our hope that Russia has any interest in preserving the INF Treaty, despite Moscow’s public statements to the contrary," Thompson noted. This entry was posted in National Security and tagged Donald Trump, Russia. Bookmark the permalink.